You only have to set foot on Calabanga’s heart (the ever commotion-packed Parada) in order to know its language. “Oatat ka man magmarat nin iwos?” a Calabangueño would ask you if you are a stranger. Several dialects would come rushing into your mind but not a single word from the sentence just uttered would equal that which you think you know. That of the Calabangueños is far distinct and tells why he is from the town rather than an outsider. What lies beyond the masive Bicol river? Folks in pensive mood about the future? Editor’s Note: This is a dated feature of Cbanga360, only minor editing was done. A walk down memory lane with the colorful words and description by the author who had her childhood years and early adulthood spent in Calabanga. Of course the town’s landscape has changed drastically to what can be obtained now: circa 2011 as versus that of the early 80’s. This sowi (reverse) dialect has an obscure origin. Some say it was mouthed out unconsciously while some contend it sprang from the Calabangueño’s vain desire to be different. Some, however, reiterated that this originated from the good-for-nothing fellows (the tambays) in their day-to-day attempts to attract attention of passersby, especially “chicks” (girls) by hurling inverted Bicol words interspersed with nosy catcalls. Whoever grabs the credit (or discredit), the fact is, it has dominated most of the native’s tongue for several motives—good or otherwise. For one thing, a Calabangueño can talk honestly with this new inverted dialect to a fellow town mate about a third person or something. He could praise profusely as well as he could censure to his heart’s desire. With this he could curse an enemy while smiling. Or, how many times has he spared himself or his friend’s life by telling in “sowi” language the secret plot or the onslaught of an enemy (especially an enemy from other town). Thus, “ukabs kang yanut na taga igdied kung iads ka oatat magmarat ni iwos.” Bako kang tunay na taga igdi kung dai ka tataong magtaram nin sowi), (You are not a local of the place if you do not know how to speak the inverted words) so a Calabangueño says. Calabangueño’s bouyant faces despite the hard realities of life confronting them on a daily basis. Besides his distinct dialect, he knows his town and his people. A grader for instance could exactly tell why Daculang Dalan (the big alley at Del Carmen) is so named; why the twin roads (San Pablo and San Francisco) is a twin road; why is the Gavaldon building once a haunted school and why the amhi tree at its backyard was cut off (because of the engcantos); why the notoriously famed parabansoc suddenly stopped molesting children (real or reel); why a Hippo is not a Jester, a Dusa, a Saints, a Cadca or a Philos; why Quipayo is Calabanga’s pot of gold; why James theater is not a billiard hall or a gambling den; why “Panalo” is a household word than Sabang. A Calabangueño’s intelligence is manifest in whatever he does. He could, for instance, make the monotony of day-to-day life bearable with wine and liquor. At sunrise, noon or sunset, he wants to be with friends- people he treasures much and no amount of talking could make them feel treasured unless the talking (sometimes arguing) be held over a glass of wine. When he goes home at midnight or beyond, either his wife nags him or scolds him and is left out the whole night or outside the kulambo (mosquito net), if “crime” is grave! On Sundays, he joins the throng of movie buffs and inquires why Rio Locsin was raped and how (Disgrasyada) or whether it was Heathcliff or Edgar Linton who impregnated Catherine Earnshaw of Wuthering Heights fame. In the evening, he’ll love to stroll around (this link leads to a post about the Tible monument) Tible’s plaza (the town’s only) and sometimes drop by nearby beer joints for a bottle or two in the company of a sweetheart or a friend. In-between his gulps, he feels the necessity of swinging with the music and out, he goes to F.L. disco pad. He swirls and twirls with the Bee Gees tragedy and laughters. And when tiredness gets the better of him, he longs for the music that really soothes the senses, and alone, he goes to VilRus. Here he loves and for one fleeting moment, feels the world. He also gambles- lucky nine, poker, 44, pusoy, entre cuatro, padis-padis, bingo, monte, mahjong- you name in, he can play it. For variety, he goes to Calabanga gallery and experiences how it is to be torn into shreds if the rooster he made a bet with his P50.00 lost in the fight. He goes home whispering an oath of Emerson “one vice can maintain two children” and wishes to be a good boy forever (if there are no more Sundays in a week). If you have a chance, try visit Calabanga. Meet a Calabangueño and talk to him. Better yet, try scheduling your trip here during the town fiesta, if not this year, then next year. More Ed’s note: Even if some details are already outdated we are publishing here: A CLOSER LOOK AT A CALABANGUEñO by Ms. Araceli G. Calomos. She was past Editor, then Adviser, of the Naga College Foundation’s publication The Naga Collegian. At present, she is a faculty member of the College of Arts and Sciences at the University of Nueva Caceres in Naga city. This article first appeared in the commemorative issue of My Hometown. Celle is an English college professor first at the University of Nueva Caceres, later and now at the Naga College Foundation, her Alma Mater. Her gems are her four handsome sons. She says she is still a dreamer and a hopeless romantic. But most of all, a lover of the Bicol language and hopes to contribue to preserve and propagate its use. Celle has more energy to spare she is also the chief editor of the "Vine," the Catholic newsletter of LLFCC community at the Archbishop's Palace in Naga city. This entry was posted in FOOTNOTES and tagged Bicol House Journal, footnotes, literary, prose & poetry. Bookmark the permalink. First Jose Rizal Bust Was Installed In the town of Siruma? Sunday, September 17, 1972. At a distance, yesterday, the Colgante bridge looked beautiful, with colorful buntings and lighted with different colored bulbs. As the day’s sun descended, the bridge’s silhuette on the Naga river provided a lovely backdrop for the still unfolding culmination of the Peñafrancia religious festivities. Just mention The Bicol High School and The Bicol Teachers College and it will trigger enough interest and talk, and more of an endless poignant memory recall of its surviving and now aging students. Semana santa is a tradition deeply rooted in the heart of every Calabangueño. The holy event is ever so old and yet always new. The Calabangueño reflects in solitude, in sanctity and in seclusion. Deep in his heart finds joy and anticipation of the filial, friendly and Godly devotion renewed and refreshed by the holy week celebration. Thus, it tugs him to go on a yearly exodus he just wouldn’t want to miss. To her native sons and daughters, Calabanga is a beautiful town even if it seems slow in making progress. Many of its sons and daughters have left her to find their fortunes elsewhere or their particular place in the sun, but it is not a final breakaway. The town of Siruma boasts of white sand beaches almost equal to that of Caramoan’s. But wait, the beaches of Siruma languishes for attention and development. Camarines Sur has invested, time and resources for Caramoan’s development and Siruma is waiting. During a portion of the war years the governor of Camarines Sur was Mariano Villafuerte. 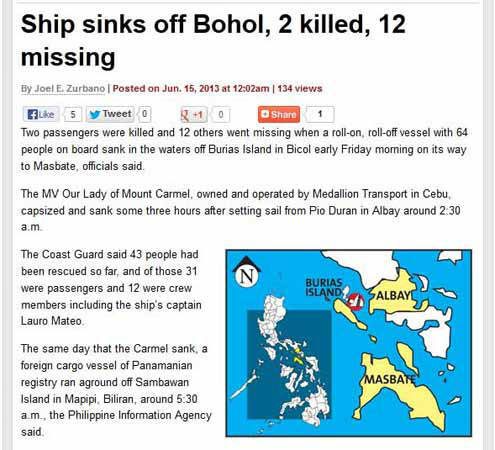 Together with wife, Soledad, eldest son Manuel, Japanese military officer named Kwasima, Villafuerte took a motorboat from Sabang, Calabanga and landed at the barrio of Vito in Siruma. The fleeing governor was looking for an influential leader named Pedro P to seek aid and become his intermediary, but who left with his own family much earlier before their arrival. After the May 10, 2010 general elections, the local government of Siruma and its town folks received its first ever and most distinguished visitor of the land, and a surprise yet. The quaint, little and big town of Siruma lies on the northeastern section of Camarines Sur, much properly on a peninsula jutting out to the sea. Its shores is lapped by the cool waves of the Pacific, while the inland territory is generally of mountainous terrain abundantly sun-basked. Fifty eight years last month, in November 18, 1952, the former mayor of Calabanga town unveiled a donation of a (cement) bench located at the plaza. Now with the onslaught of change and modest modernization, the bench still occupies its original location. But it has served its purpose and the passage of time clearly made its mark. Here and now, the Bicol river’s name was for the second time used in disgrace, shame and shambles. The unfinished dam will remain the tangible evidence to this for people to see in the years to come. As always, failures leave behind some ugly memorials. Easily, then, Bicol river is both the queen and mother of all rivers in southern Luzon due to its size and influence. It holds sway and impact on the fertile and floodplains of the provinces, dictating the state of economic well-being and status affecting thousands of lives of people- including farmers, fisherfolks, travellers, etc., around its sphere of natural terrain. The banca operator is so experienced he managed to device a system of not going straight ahead after departing from Balongay but instead maneuvers a sharp curved route to curtail the push and shove of the current. Imagine being in a crib on a rocking motion. Just looking at the transport boat, do not expect amenities of comfort for the seat will be a piece of bamboo pole nailed across its rim. At the edge of the river bank, a waiting shade serves as the landing-terminal point for arriving and departing passengers. One can let time pass just by sitting on the steps or on the cement seats. I did just that and kept awed and bewildered at how huge and overwhelming the Bicol river is. Then I heard about the skyway bridges that will span the river, connecting the towns of Libmanan and Canaman. The structure will be built much farther inside and farther from Balongay. The loss of Calabanga and Cabusao became the gain of Libmanan and Canaman. Lucky folks of these towns. Live Blogging for Peñafrancia Fluvial!!! We will attempt to do a live blogging of the Penafrancia fluvial procession here!! This post will continuously get live update!!! When I remember my hometown, Calabanga, it is always summer. It is a small town at the foot of the overwhelming Isarog, which is lapped by the San Miguel bay. The town is a lovely place where the skies are bluer than I’ve ever seen them anywhere and the sea is as calm as a still night and overpowering when angry.